While many investors fret about bonds or bond-like proxies from rising interest rates, the real danger lurking in the shadows is the prospect of rising risk premiums. Interest rates globally have already normalised, or maybe there is a little more to go. However, bond-like stocks already have wide risk premiums. The risk premiums for other stocks are still extremely low though... and they have yet to normalise! A 'bondcano' moment looms large for many non-bond-like securities. Many of these stocks have low risk premiums or in Benjamin Graham’s language, ‘little margin of safety’. This means that any bad news including rising interest rates, could pop their valuation bubble. Over the last few months, the fear of missing out has driven many investors into highly cyclical or high PE stocks irrespective of low risk premiums. The number of highly priced growth stocks have been increasing in recent years. As they become more prevalent and expensive they become a bigger part of the index. Unfortunately, there is no long term valuation data on the Australian stock market to make a proper assessment on long term performance. In the US, the Shiller cyclically adjusted PE (CAPE) index has tracked the valuation of the S&P500 over the last century. Ominously, the CAPE index has recently surpassed the 1929 peak and is fast approaching the technology boom peak. If you thought the Global Financial Crisis (GFC) was tough for equity markets, at least future returns were somewhat preserved because valuations in 2007 were not extremely stretched. The subsequent 10-year return from the S&P500 peak prior to the GFC still delivered a modest 5% per annum. If history is a guide, the current high CAPE index indicates that the next 10-year annualised return is likely to be close to 0%. In other words, the next decade of returns from the US stock market will likely be worse than the 10-year period post the GFC. 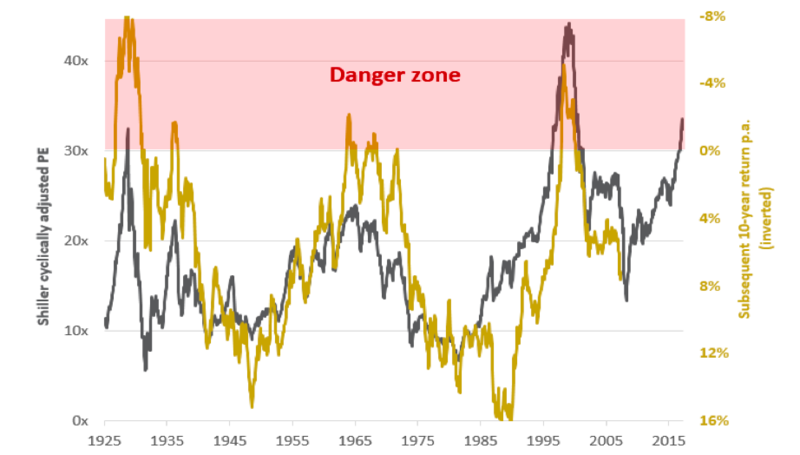 And if momentum pushes the CAPE index even higher into the danger zone, long term expected returns could be negative. There is little margin of safety and the flash crash in early February provided a small taste of what is to come when low risk premiums suddenly mean revert. Those who ignore risk premiums do so at their own peril because it is an important anchor for long term returns. When valuations are very high (from low risk premiums) prices will eventually collapse under their own weight. So how can investors generate decent results in a low return environment? Invest in securities with wide risk premiums that can absorb negative fundamentals. In other words, invest in securities when fear drives a large gap between perception and reality. Three years ago, there was extreme fear with commodity-related stocks when China was on the brink of a recession. Fortunately, China kick-started their economy through large fiscal and monetary measures. When China put a floor under commodity prices, mining stocks performed well thereafter. As fear subsided, their risk premiums shrunk, forcing up their valuations. In today’s environment, there is extreme fear and misinformation about rising interest rates, even though Australian rates have been benign. Hence, some Australian bond-like stocks are priced with wide risk premiums. Even if interest rates do rise, their wide risk premiums have the potential to narrow and hence preserve value. On the other hand, if perceived fear subsides, a shrinking risk premium will deliver reasonable returns.